JM203P 3 mil, Premium PTFE fiberglass woven fabric substrates have the highest PTFE content 3 N/A N/A Packaging, food products, printing and textiles, polymer processing, building products, chemical processing, aerospace, communications and military. JM205P 5 mil, Premium PTFE fiberglass woven fabric substrates have the highest PTFE content 5 N/A N/A Packaging, food products, printing and textiles, polymer processing, building products, chemical processing, aerospace, communications and military. JM206P 6 mil, Premium PTFE fiberglass woven fabric substrates have the highest PTFE content 6 N/A N/A Packaging, food products, printing and textiles, polymer processing, building products, chemical processing, aerospace, communications and military. JM210P 10 mil, Premium PTFE fiberglass woven fabric substrates have the highest PTFE content 10 N/A N/A Packaging, food products, printing and textiles, polymer processing, building products, chemical processing, aerospace, communications and military. JM302 2 mil, skived PTFE film tape coated with a high temperature silicone adhesive 3.5 30 oz. Silicone Release surface on packaging equipment and heat sealing machines, roll coverings on plastic extruders guide rails, and angle bars in graphic arts industry. 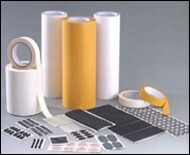 JM303 3 mil, skived PTFE film tape coated with a high temperature silicone adhesive 4.5 35 oz. 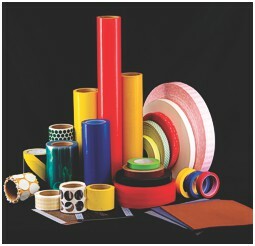 Silicone Release surface on packaging equipment and heat sealing machines, roll coverings on plastic extruders guide rails, and angle bars in graphic arts industry. JM305 5 mil, skived PTFE film tape coated with a high temperature silicone adhesive 6.5 40 oz. Silicone Release surface on packaging equipment and heat sealing machines, roll coverings on plastic extruders guide rails, and angle bars in graphic arts industry. JM310 10 mil, skived PTFE film tape coated with a high temperature silicone adhesive 11.5 50 oz. Silicone Release surface on packaging equipment and heat sealing machines, roll coverings on plastic extruders guide rails, and angle bars in graphic arts industry. T-TAPE 5 mil, skived PTFE film tape with a silicone adhesive and the film side offers low coefficient of friction PTFE film 6 30 oz. Silicone Release surface on packaging equipment and heat sealing machines, roll coverings on plastic extruders guide rails, and angle bars in graphic arts industry. 27156R 5 mil, fiberglass fabric, impregnated with PTFE dispersion and coated with high temperature super stick silicone adhesive 7.3 60 Silicone Ideal for release surface on heat sealer, blister formation and form-fill seal equipment. Also, for lining of guide rails, chutes and slides. JM403 3 mil, UHMW - ultra high molecular weight polyethylene provides a non-stick, low friction surface; single coated with an aggressive acrylic adhesive 4.5 30 oz. Acrylic Ideal for automotive and mechanical applications and anywhere high pressure sliding occurs; provides sound dampening and eliminates rattles. JM405 5 mil, UHMW - ultra high molecular weight polyethylene provides a non-stick, low friction surface; single coated with an aggressive acrylic adhesive on a white paper liner 6.5 45 oz. Acrylic Ideal for automotive and mechanical applications and anywhere high pressure sliding occurs; provides sound dampening and eliminates rattles. JM410 10 mil, UHMW - ultra high molecular weight polyethylene provides a non-stick, low friction surface; single coated with an aggressive acrylic adhesive on a blue polyester liner 11.5 50 oz. Acrylic Ideal for automotive and mechanical applications and anywhere high pressure sliding occurs; provides sound dampening and eliminates rattles. JM103 3 mil, PTFE fiberglass woven fabric tape available with an acrylic or silicone adhesive, with or without a liner 5 45/40 oz. Silicone/ Acrylic Packaging, food products, printing and textiles, building products, chemical processing, aerospace, communications, military, pulp and paper, electronics. JM105 5 mil, PTFE fiberglass woven fabric tape available with an acrylic or silicone adhesive, with or without a liner 7/7.5 50/45 oz. Silicone/ Acrylic Packaging, food products, printing and textiles, building products, chemical processing, aerospace, communications, military, pulp and paper, electronics. JM106 6 mil, PTFE fiberglass woven fabric tape available with an acrylic or silicone adhesive, with or without a liner 8/8.5 50/45 oz. Silicone/ Acrylic Packaging, food products, printing and textiles, building products, chemical processing, aerospace, communications, military, pulp and paper, electronics. JM110 10 mil, PTFE fiberglass woven fabric tape available with an acrylic or silicone adhesive, with or without a liner 12.5 50/45 oz. Silicone/ Acrylic Packaging, food products, printing and textiles, building products, chemical processing, aerospace, communications, military, pulp and paper, electronics. JM114 14 mil, PTFE fiberglass woven fabric tape available with an acrylic or silicone adhesive, with or without a liner 16.5 50/45 oz. Silicone/ Acrylic Packaging, food products, printing and textiles, building products, chemical processing, aerospace, communications, military, pulp and paper, electronics. JM203I 3 mil, Industrial PTFE fiberglass woven fabric substrate, possesses an optimal PTFE content; USDA approved 3 N/A N/A Packaging, food products, printing and textiles, polymer processing, building products, chemical processing aerospace, communications and military. JM205I 5 mil, Industrial PTFE fiberglass woven fabric substrate, possesses an optimal PTFE content; USDA approved 5 N/A N/A Packaging, food products, printing and textiles, polymer processing, building products, chemical processing aerospace, communications and military. JM206I 6 mil, Industrial PTFE fiberglass woven fabric substrate, possesses an optimal PTFE content; USDA approved 6 N/A N/A Packaging, food products, printing and textiles, polymer processing, building products, chemical processing aerospace, communications and military. JM210I 10 mil, Industrial PTFE fiberglass woven fabric substrate, possesses an optimal PTFE content; USDA approved 10 N/A N/A Packaging, food products, printing and textiles, polymer processing, building products, chemical processing aerospace, communications and military. 100S Orange/Tan, Strip-N-Stick(R) silicone sponge tape with a high temperature silicone adhesive; available in 1/16" to 3/16" thickness 0.0625 to .188 15 oz. Silicone Gasketing, cushioning, thermal insulation and vibration dampening applications. 200A Orange/Tan, Strip-N-Stick(R) silicone sponge tape with an aggressive acrylic adhesive; available in 1/16" to 3/16" thickness 0.0625 to .188 30 oz. Acrylic Gasketing, cushioning, thermal insulation and vibration dampening applications. 300AR Blue, Strip-N-Stick(R) is a reinforced silicone sponge tape with an acrylic adhesive; available in 1/16" to 3/16" thickness 0.0625 to .188 30 oz. Acrylic Gasketing, cushioning, thermal insulation and vibration dampening applications. 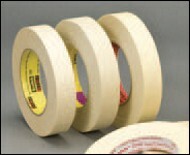 440A Gray, Strip-N-Stick(R) solid rubber tape with a high temperature acrylic adhesive 0.0312 30 oz. Acrylic Gasketing, cushioning, thermal insulation and vibration dampening applications. 440S Gray, Strip-N-Stick(R) solid silicone tape with a high temperature silicone adhesive 0.0312 15 oz. Silicone Gasketing, cushioning, thermal insulation and vibration dampening applications. 5213WH White, PTFE woven fiberglass substrate that is coated on one or both side with silicone rubber Various N/A N/A Packaging, food, aerospace, communications, military, insulation and protection.